Olimp CarboNox is a supplement comprising three different sources of carbohydrates, enriched with L-arginine, vitamins and minerals. Carefully selected sources of carbohydrates vary in their glycaemic index (GI) values and absorption rate, providing a constant supply of glucose to muscles. The supplement is effective in improving your physical performance, delaying the onset of fatigue and increasing exercise tolerance. It is enriched with L-arginine to boost oxygen transport in the body and vitamins and minerals to enhance energy production and stimulate energy metabolism. Carbohydrates are a preferred source of energy for skeletal muscles. Because of that, it is important to consume adequate amounts of easily absorbed carbohydrates before and after a workout. They will help increase muscle power and strength, improve the body’s performance and delay the onset of fatigue. The combination of carbohydrates with different absorption rates provides constant access to glucose and prevents drops in energy during long workouts. Furthermore, carbohydrates consumed just after exercise help replenish muscle glycogen stores, speeding up the recovery between training sessions. Glucose – a simple sugar with a high glycaemic index (100). It is absorbed quickly and easily from the gastrointestinal tract. As a consequence, it is an immediate and preffered source of energy for muscles. Glucose intake during or a short while before a workout may allow you to sustain a high power output or train longer. Maltodextrin – an easily digested complex sugar, characterised by a high GI (~110). Nonetheless, it is gradually released into the bloodstream and gives you a steady energy supply during long-term exercise. When you complete your training session, maltodextrin effectively replenishes muscle glycogen stores and accelerates the body’s recovery process. Isomaltulose – a compound classified among disaccharides which has a low GI (32). It delivers sustained-release carbohydrates, without causing fluctuations in blood sugar levels. It is a perfect source of energy for individuals performing long workouts, which is easily digested when it is consumed between meals. L-Arginine – a non-proteinogenic amino acid which boosts nitric oxide (NO) levels in the body and thus effectively reduces fatigue and allows you to increase exercise intensity. NO is a gaseous hormone which widens blood vessels, thereby improving blood flow and nutrient delivery to muscles. As a result, it reduces energy expenditure and cardiac output and speeds up post-workout recovery. B vitamins: Vitamin B1, B2, B5 (pantothenic acid), B6, B7 (biotin), B9 (folic acid) and B12) – necessary for energy production and efficient energy metabolism. They are also involved in the metabolism of carbohydrates and other nutrients, are critical to the functioning of the nervous system, reduce mental fatigue and take part in the synthesis of hormones and neurotransmitters. Other vitamins: Vitamin A, C, D and E – participate in redox reactions and have antioxidant potential. They help eliminate free radicals produced due to training overload, build bones and produce collagen. Minerals: calcium, magnesium, iron, manganese, iodine, chromium, molybdenum and selenium – involved in energy production and hematopoietic processes. They support the function of the thyroid, responsible for nutrient metabolism and maintenance of a constant body temperature, improve insulin sensitivity and ensure efficient carbohydrate metabolism. 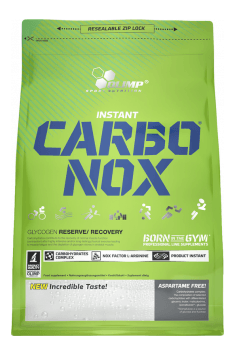 To sum up, Olimp CarboNox is a high-quality supplement with easily digested carbohydrates and L-arginine, vitamins and minerals. It provides energy delivery during vigorous and long workouts, thereby improving your athletic performance. It also speeds up muscle glycogen resynthesis and widens blood vessels, consequently boosting energy levels. It provides also essential vitamins and minerals to stimulate biochemical processes and energy production in the body. bardzo dobre i niedrogie węglowodany.. polecam smak ananasowy! Dissolve 1 portion (50 g – 90 units = 30 scoops or 5 flat tablespoon) in 100 ml of water. Drink 30 minutes before and directly after the training. Depending on the sport discipline and training intensity, it is recommended from 2 to 4 portions a day. Because of the arginine addition, it will work perfectly around training times, especially before. It may also be used during long sessions of endurance training. It is not recommended to use on non-workout days. It is better to provide carbohydrates with food. 95% carbohydrates complex (maltodextrins, glucose, isomaltulose), acidity regulators – malic acid, citric acid; aromas, sweeteners – acesulfame K, sucralose, cyclamates; colours: beta-carotene, carmine, riboflavin (orange flavour), carmine (strawberry, grapefruit, cherry flavours), riboflavin (lemon flavour).